You can find many websites to talk to people on Internet. Unfortunately there are not too much Armenian webcam chat. However you can also find some online Armenian text chat sites. We are going to recommend you some sites from this country on this page and we hope these are going to be useful for you. There are no generally age requirements for join such sites. There are some java, flash and IRC based websites. You will need to use IRC clients like mIRC on some of those channels which we are going to introduce some pages for you on this page. It’s a global social networking site of Armenia and there are three different kind of platforms on there. One of them is flash which is based on an IRC server. Flash version is connecting to ICQ‘s IRC server and you can chat with Armenia people in this site. You will only speak with your partners with text here. If you have downloaded an ICQ program you can also add people as a friend while you are chatting and you can keep connection with your partner. You can also talk with webcam to your friends and strangers on ICQ. In web version there are a few online people on chat rooms. You can communicate with people via webcam. Armenia webcam chat with ICQ is a good opportunity for those who are seeking a partner. There’s also a Java social network in site. Update: ICQ Chat Rooms are no longer available. It’s another java platform for Armenia which can provide you Armenian text chat service. It’s simple to use and not hard to find a partner here. There’s no webcam at Haykarot. It’s only text. People are preferring to talk to people in their own language but there are still some people who knows English. Update: Haykarot Chat is no longer available. 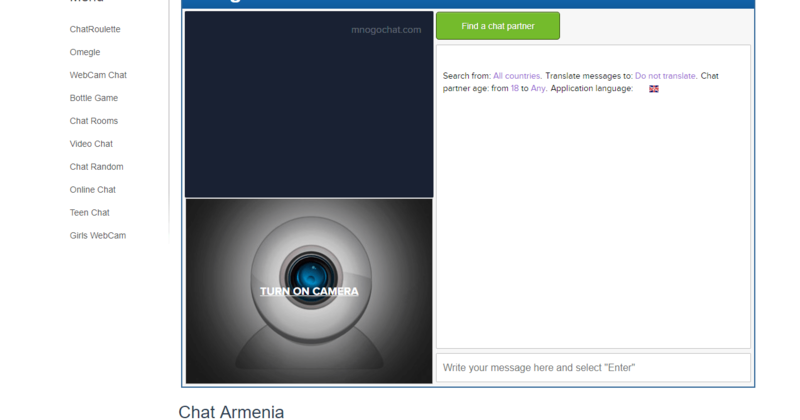 You can also try Mnogo Chat for Armenian Webcam Chat. Mnogo is also another good opportunity for you talk to strangers from Armenia. You can make friends from the country and you will able to talk to with your camera and microphone. No registration needed for this service and this is free. You will also need to turn your camera on before you enter to this Armenian webcam chat site. I am half Irish, quarter English and quarter Armenian. I am quarter Armenian because my grandpa is Armenian. I want to have penpals from Armenia. Please let me know if you are interested with this. I believe you will hardly find a penpal from here but we hope that you will able to find soon. If you want to meet someone from this country, we believe that, you can get some of them through penpal friendship sites. We will also mention about those websites very soon on How to Chat Online. I am half Armenian, half Georgian and I am living in Tbilisi. I am looking for a mate from Yerevan. Girl or guy… Doesn’t matter. Hello I am from South Africa and I would like to meet with Armenian Boys. I am actually Armenian but My ancestors have came to South Africa because of Genocide for years ago. My name is Angela and waiting any response of Armenian Boys. Please leave your Skype ID here! I am an Armenian who is living in France. I am seeking an Armenian girl from United states. Please contact me if you are interest a meeting in Los Angeles. Thank you!